In honor of Bratwurst Day, I thought I would share some steps on how to make sauerkraut successfully at home to accompany your cookout fare. I recently did a class at the German-American Heritage Center on this very topic and my sauerkraut recipes were a big hit. You can download these recipes at the link below! The first thing you should know is that sauerkraut is a product of fermentation. Fermentation is simply the process in which a substance breaks down into simpler components. Microorganisms like yeast, bacteria and mold play a role in the fermentation process, creating foods and drinks such as beer, wine, sourdough bread, sauerkraut, kimchi, yogurt, chocolate, pickles, tempeh, natto and miso. In many parts of the world, food is fermented not only for preservation purposes but also to create a safe and secure food supply. To dispel the most common myth about lacto-fermentation, it doesn't necessarily have anything to do with dairy as some relate "lacto" to the lactose (sugar) in milk. Instead, the lacto refers to lactic acid that's produced during the fermentation process by lactic-acid producing bacteria which are present on the surface of all fruits and vegetables. The natural acids and other antimicrobial compounds produced by the fermenting bacteria inhibit the growth of other harmful bacteria, molds and yeasts that contribute to spoilage making fermentation one of the safest forms of food preservation. Additionally, the carbon dioxide produced during the fermentation process helps maintain the low-oxygen conditions necessary for the fermenting bacteria, as well as aid in the stabilization of the flavor and color of the vegetables. 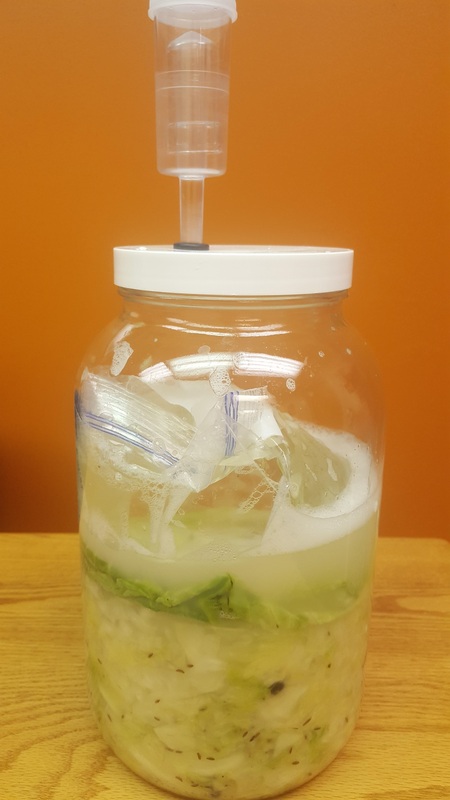 Getting Started with Vegetable Fermentation- a printable handout with information on tools needed, suitable vessels, water source, salt quality, temperatures, tips on keeping vegetables submerged, determining readiness of your final product and cleaning equipment. I also made an Apple Kraut which is one of my favorites. When looking at the Golden Kraut recipe, substitute the garlic, ginger and turmeric for 1 granny smith apple and 1 Tbsp each of caraway seeds and juniper berries. It was slightly sweet, crunchy and so good! Feel free to experiment with different seasonings but don't adjust the salt concentration in your ferment. It's needed for many reasons, all of which are stated in the "Getting Started with Vegetable Fermentation". USDA. 2009. USDA Complete Guide to Home Canning.